Turnaround for Children Partnership Development Director Ronni Gambardella was keynote speaker at the DCMO BOCES LINKS 20 event at Unadilla Valley Central School in New Berlin, NY. DCMO BOCES — The Delaware-Chenango-Madison-Otsego Board of Cooperative Educational Services — is a regional educational agency providing services in partnership with 16 local school districts, and is one of 37 BOCES across New York State working in collaboration with local school districts to offer programs to students, teachers, administrators and the community. Gambardella’s address, “Connecting the Dots between Science, Adversity and School Performance,” outlined how schools can be designed to support and personalize learning for the whole child. The keynote was attended by over 100 superintendents, principals, teachers, counselors and community members. 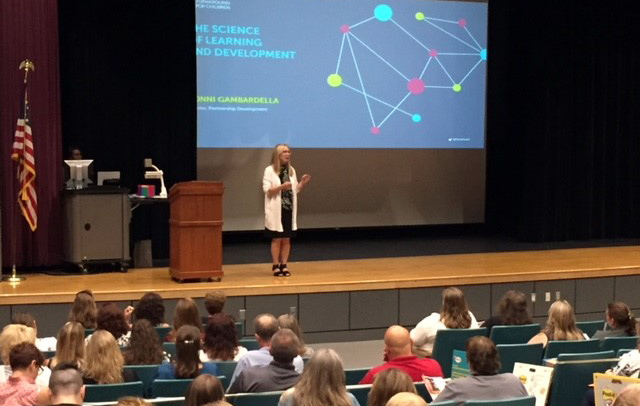 During the presentation, Gambardella provided practical examples through class-builders and brain breaks that educators could take back and implement in their own regions, districts and schools. She also spoke about the malleability of the brain and the impact Adverse Childhood Experiences (ACEs) can have on children’s development and learning. 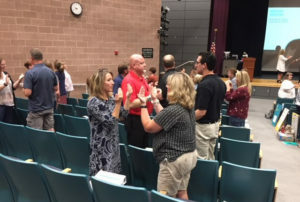 The keynote was followed by breakout sessions where groups reflected on the content of Gambardella’s address and leveraged it to plan for the school year ahead.